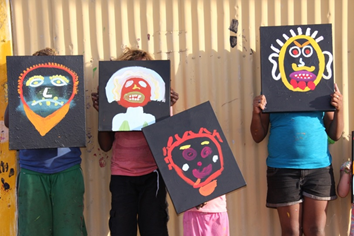 Warakurna Artists offers a range of social, creative and cultural activities to residents of Warakurna and Wanarn communities. This innovative project is has been designed by the young people of Warakurna in collaboration with Warakurna Artists and includes a series of dynamic and intensive programs. These including music development, photography, film and post production workshops, development of branding and merchandise (retail and micro enterprise development). If you would like to support any of our programs please contact us click here. Weekly painting workshops are delivered primarily to elderly and frail residents at the Wanarn Aged Care facility, located approximately 100kms west of Warakurna in Wanarn community. All Wanarn residents are welcome to participate in the weekly painting workshops conducted at Wanarn Aged Care. Wanarn Community don’t have an Art Centre building so to help support artist’s artistic development Warakurna Artists periodically creates a a very popular ‘pop-up’ studio in the old store building. Warakurna Artists runs a weekly after school and school holiday arts and crafts program for the kids. The Tjitji come to the studio to paint with their families, learning the Tjukurrpa and different painting and craft techniques.